The new and improved Swiffer Wet Jet cleans better than a mop. Swiffer added dual nozzles and a larger scrubber to aid in cleaning up the most stubborn dirt. As a busy mom of four children I need something that will clean up their messes without having to spend hours scrubbing. Back when our grandmother’s were raising our parents all they had to clean their floors was the trusty old mop and bucket. My own mother used to get down on her hands and knees with a bucket and rag to clean the kitchen floor. Now our lives are even busier. We shuttle our kids to school and after school activities, get the groceries every week, manage a household and some of us also work. Being a mom is tough and time consuming. Housecleaning should not take hours out of our day. Not only does the Swiffer Wet Jet take up less time it does a great job. 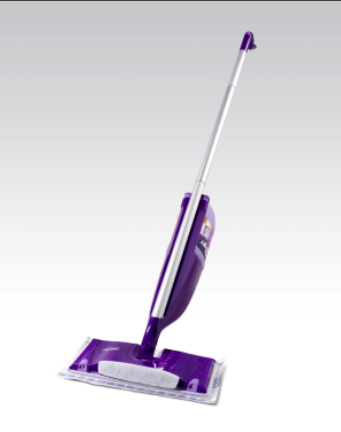 It delivers a powerful cleaning solution directly to your floor with just a push of a button. The cleaning pad picks up nearly all the lose dirt left behind. The Wet Jet is easily maneuverable and fits in between furniture. For a healthy clean home in half the time you can purchase the Swiffer Wet Jet at your local Wal-Mart store. I have a normal wet jet but I don't know where the replacement pads are. My mom was kind enough to mop while I was on vacation but she didn't replace the pad and now I need mop but am out of luck.